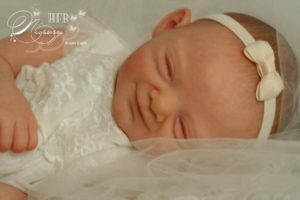 This heavenly reborn baby doll is currently for sale on ebay. She has been painted to a very high standard and look very real. This beautiful little girl is Milo. She is sculpted by the very talented Heike Kolpin. Milo comes with her Certificate of Authenticity. 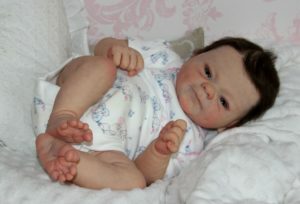 I have lovingly transformed Milo into this adorable baby girl. 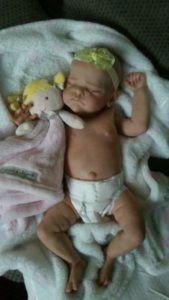 She wears newborn or first sized clothes. She has been painted with many thin, translucent layers of Genesis Heat Set Paints to achieve her very true to life skin tones. With subtle veining and baby mottling she looks very real indeed. Nostrils have not been opened. 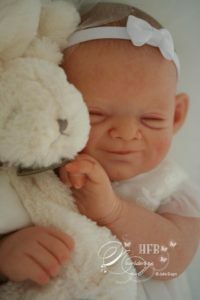 She has adorable little fingers and toes which have also had a lot of attention to detail, in fact not one crease has been missed from head to toe. Lips and nails have been given a satin finish. Milo has full arms and full legs. She has a fabric body which I have weighted with high-quality and non-toxic materials. Arms, legs, head have been filled with glass granules and topped with fibre fill. Her body has been filled with glass granules enclosed in a nylon stocking also squigy baby fat and topped with fibre fill. I never use sand or any other materials to fill my babies. Her hair has been directionally painted and textured with multi shades of brown. 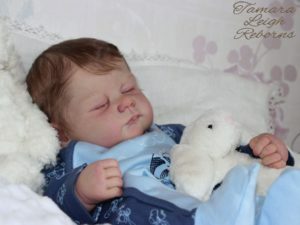 Many layers of tiny thin hairs to look just like a real babys hair. She has barely there eyebrows and hand applied eyelashes which have been glued on the inside. She has been sealed with my unique blend to give a slightly textured but soft feel. 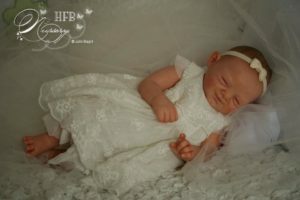 I always use the best quality materials available to make my babies and being a perfectionist I never list a baby until I am 100% happy with it. She has her own magnetic pacifier. All of my photos have been taken at various times of the day, sometimes I have to use artificial lighting due to the dull weather we have. None of my photos have been altered in any way. All my babies are born in a smoke free home. I have adopted babies all over the world, please see my excellent feedback. 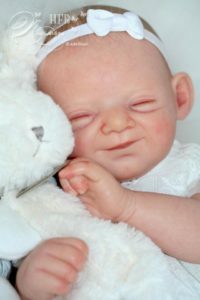 All other items are props and are not included in this babys auction. All clothes are brand new.